Gurez: An old gem nestled between lofty mountains that sit along the banks of river Kishanganga. The picturesque valley of Gurez tucked amidst lofty mountains was once the gateway to the famous Silk Route running across Asia. The thickly forested valley, with its bountiful scenic beauty attracts hundreds of local and foreign tourists all year round. 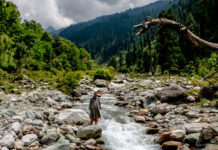 Located at a distance of 131 kilometers from Srinagar, it takes approximately 7 hours by road to reach Gurez valley, famously known as the Crown of Kashmir. 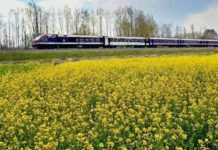 Every year, this far-flung region of Jammu and Kashmir is cut off from the rest of the country for nearly seven months due to heavy snowfall. The valley has diverse fauna and wildlife including the Himalayan brown bear and the snow leopard. The Kishanganga River flows through the valley. The road to Gilgit runs through Gurez. Gurez is divided into three regions. The area from Toabat to Sharda Peeth is administered by Pakistan as Neelum District, that between Kamri and Minimarg is part of the Astore District, Northern Areas, Pakistan, and that from Toabat to Abdullae Tulail is known as Tehsil Gurez, and is part of Bandipore district. People of Gurez valley are Dards, they speak Sheena language and have their ancestral connection with Gilgit valley now in Pakistan. The feature and attire of the Dards are similar to Kashmiri people of mountain region. Though Gurez is a far flung area but the people of the Dard race have uplifted themselves by the hard work and proper education. Dard women are fair with athletic built, who spend the summer in collecting wood from mountains for the harsh winter; when it is impossible to move in 20 feet out side. Ultimate adventure destination to the north of Kashrnir, Gurez, is a gateway to the famous silk route across central Asia. The pyramid shaped peak named after famous Kashmiri poetess Habba Khatoon is most fascinating peak of Kashmir. The emperor Yousuf Shah Chak who is said to be a Dard from Gilgit entered into Kashmir through Gurez. It is believed that when emperor was imprisoned by the King Akbar, his beloved Habba Khafton used to wander near the peak to look for her lover. The roar of mighty Kishan-Ganga river flowing across the valley, resonotes with surrounding mountains that lulls a visitors to sound sleep.The traditional log wood houses make Gurez no less than a European country side. 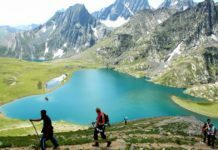 The trekking Routes from Gurez and Tilel lead upto Gangabal and Sonmorg to its east and Drass , Dahanu and Zanskar to its north. The Kishen Ganga river in Gurez offers easy level of stream for Rofting and tough ones from Tilel. Some of the mountains have absolutely challenging scope for Rock Climbing.Trout fishing is a frequent sport among locals who through in a line to get descent meal for the day. Anglers con be delighted to catch a brown trout in the Kishen Ganga River or the streams coming down from the mountains. Gurez has lovely compsites where the tents can be pitched near the river. 20 km from Gurez ,the awesome villages of Tilel have log wood houses which perfectly add to the magnificent view of mountains full of pine and fir trees. The road from Gurez to Tilel is just 7 years old, which has been extended upto Drass in Kargil region. The rugged and tough life of people of Tilel can make a visitor to contribute for promotion of the destination in one way or the other. Razdan Pass: An uphill journey from Bandipur to Razdan pass 3300m has a breathtaking view points where one can stop for a photo shot.Shrine of Peer Bubo atop Razdan pass is looked after by the army regiment on duty in the Gurez region. The saint had come from Lahore in 1933 and was buried at Razdan pass.